Camfrog 6.0.75 is now available for download. With our Camfrog 6.0 release we listened carefully to user feedback and made the changes you requested. 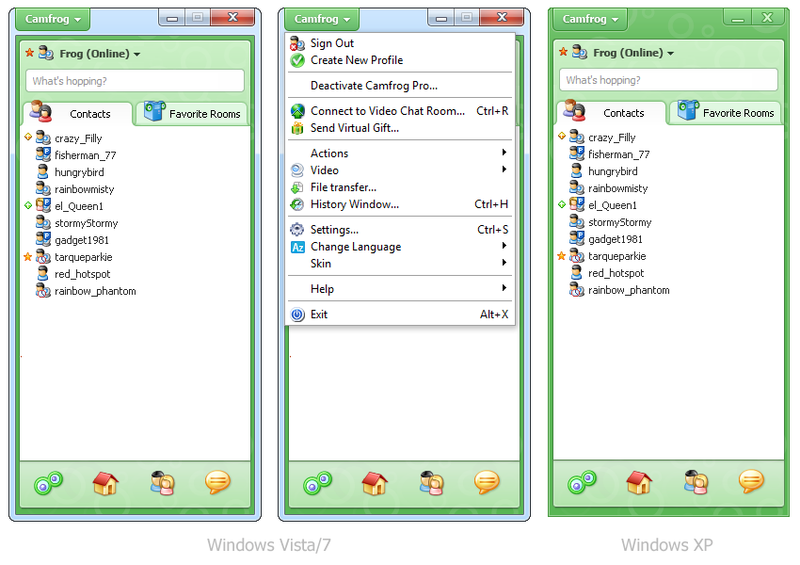 The 6.0.75 update includes the ability to change your font and font colors in instant messages and in rooms, brings back your favorite rooms in the contact list, creates new easier to use room user lists, allows you to invite your friend to the room you are in by going to the “Camfrog” menu in the video chat room window, and adds smaller ad banners and smaller notifications in IM windows. We also updated our user interface by adding a Camfrog menu at the top left. All your usual actions and settings are available under this new Camfrog menu. Our software now also auto-logs you into our website when you click a link within the software to save you time from always having to logon and logout. 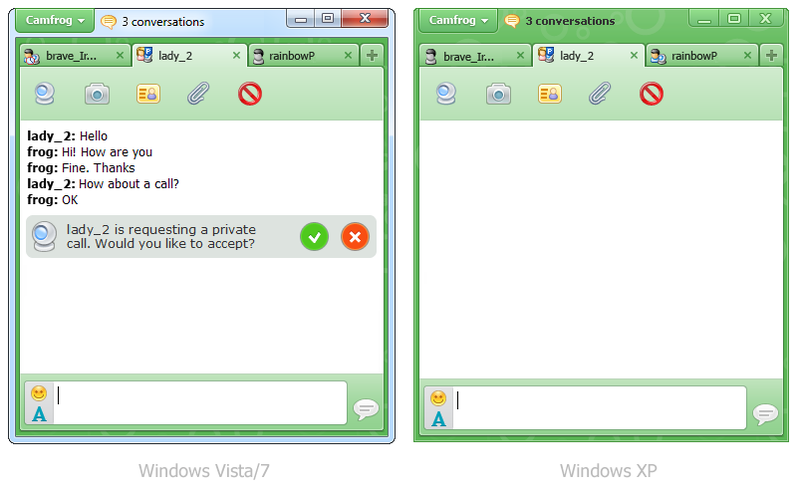 ← Camfrog Voice Chat for iPhone 2.0.23 Released! Kat Give Camfrog sometime they are working on so much these days they need to get version that has no bugs frist before they start adding things you know what mean i do agree with one window is is hard some time i think should have the old boxes but the new layout i like WELL DONE CAMFROG!!! Your right Mr/Miss Kat but new version it’s better from old you have to be sure from that and don’t forget new version have no bug so it’s protect you from hackers maybe new version so bad for you coz you still not use it long time so you see it more different and not easy to use if you try with it [ new version ] long time you will like it and able to use it more than old version Just try and you will see Have nice and great day sir !! this problem sir from his internet the someone who you watch him . he have bad or error in his internet tell him restart it or fix it . well for me camfrog video chat simply better in the world and the version 6 I think was best done until now rest are opinions. 6.0.75 has been crashing a heck of a lot. Sometimes when it’s just sitting there not doing anything. 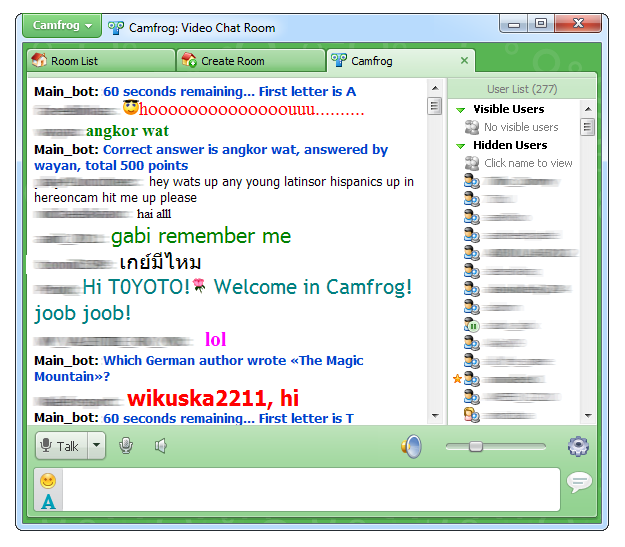 Camfrog has always been a really buggy piece of software, but it has been especially ridiculous since the 2/18 version. Before, the worst issue was new people that join a room and have webcams aren’t showing up properly that they have webcams in the user list (this issue still exists by the way), now the software itself is crashing every 5 minutes. nice work, i like the new style and skin option!! hope we can get more skin colors soon, coz i miss a black one. @ X_Jumbo_Hotdog_X, go to the green camfrog button on top >> actions >> change password. Hello 94, Camfrog did not ban any countries, Egypt – Morocco – Algeria – Libya -Saudi Arabia – Jordan – Palestine – Syria All were banned by the individual countries. Camfrog had nothing to do with those problems. More and more countries are dropping internet access due to civil unrest. look very nice but it’s a big spender of system resources (+ – 60%) and a lot of memory (+ – 500 MB to 10 Web cameras connected) does not recommend using this version is better than version 5.5. my system Intel Pentium Dual CPU T2390 1.86GHz with Windows 7 Ultimate with 3 GB of RAM. The new version has serious problems of programming, when a room is crowded the memory allocated in RAM it fires up to the max, now i see in the task manager more than 1 gigabyte occupying memory RAM and rising!!!!!!!!!!!!!!!!!! Hey Admin please i see that nickname was online > ! < Camfrog:add:! it was added for list and was online is that new bug or what ?? i’m use 6.0.75 now but look like it use memory too must. check by task manager. P.S. I already send an email to Helpdesk. Check it out. Please respond my email. I need my new purchased pro BOT serial work in BOT 3,9. It’s not fair if you issue a new policy without notice. You never inform us that new pro bot serial IS ONLY work in BOT 5.0.
still can not copy-paste emoticon…..but its not really important. Will it ever be possible to remove the two tabs at the top of the chat room box? room list/create room. This is what is making me not want to change because it just looks cluttered.